Nigel drew parallels with LS Live, describing it as ‘Europe’s biggest and best production and stage rehearsal arena complex and a truly world class Yorkshire business’ inviting the comparison with Arriva Yorkshire, another very successful local business. He referred to Margaret Thatcher’s, possibly mythical, 1986 comment that: ‘A man who, beyond the age of 26, finds himself on a bus can count himself as a failure,’ saying that while it was entirely misinformed, it did great damage to the perceptions of public transport, more damage than Reg Varney and On the Buses ever did. ‘The truth is very different,’ he said, citing three reasons. Firstly, because buses are vital for employees and employers with more people travelling to work in the UK by bus than all other forms of public transport combined. More than one in ten employees would be forced to look for another job if they could no longer commute by bus. 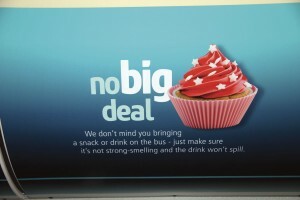 Secondly, because buses drive growth and mean serious business. He pointed out that in the areas covered by the West Yorkshire PTE, bus networks generate over £2.5bn per year in economic benefits, adding that improved access to city centres can add up to 25% more benefit to the local economy. Thirdly, Nigel said, buses are relevant to people’s lives with almost 60% of people using the bus at least once a month. Across Great Britain the local bus sector employs as many people as the rail and aviation sectors combined. He contended that rather than being the sign of failure, buses are a sign of success. The towns and cities across the country and across the world that do best are those with the best transport networks. Perhaps the quote Margaret Thatcher should have made was ‘Any city that finds itself without a great bus service can count itself a failure’. He said that everyone in Wakefield wanted to see the best possible bus system for Wakefield and found it encouraging that transport authorities, district councils, political leaders and bus operators in West Yorkshire shared a common ambition to build together the best possible public transport system they could. 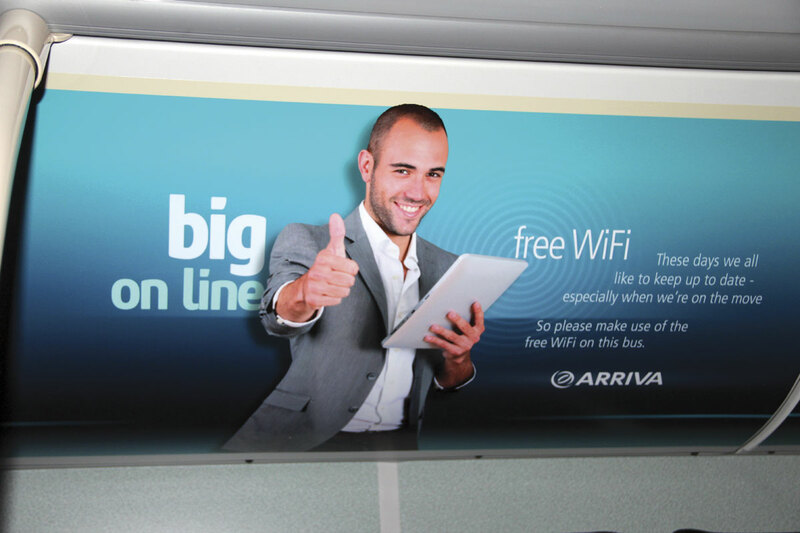 Arriva was delighted to be working towards a formal partnership relationship with the Combined Authority to do just that. 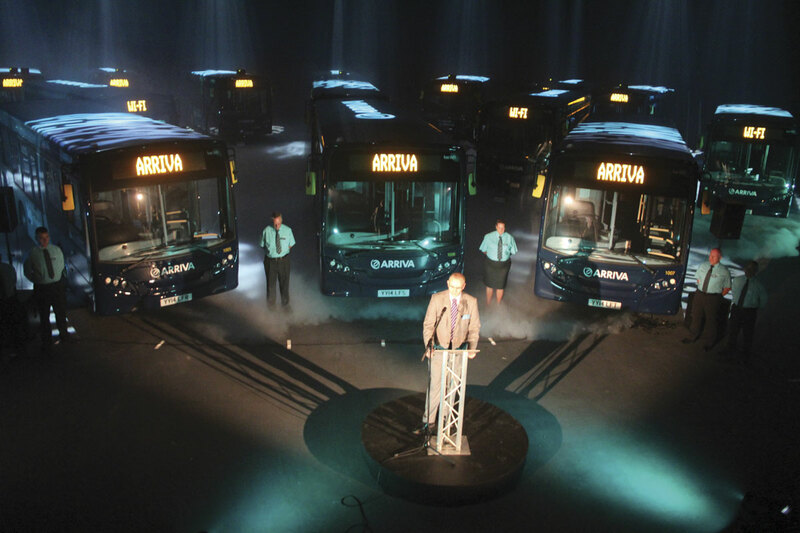 Listing some of the attributes of the new vehicles and the service Arriva Yorkshire provides, he said that today’s bus users are demanding, rightly so, and the design standards and specification of the buses reflected the company’s desire to meet those demands. Apart from free wi-fi he mentioned a free downloadable App which people can use to plan their journeys and monitor where their bus is in real time on a live map; the ability to buy bus tickets by mobile phone; ticket machines that accepted MCards as part of the region wide smartcard scheme developed between Metro and operators which is now fully operational; seats covered in e-leather to add a touch of panache and a smart new livery. 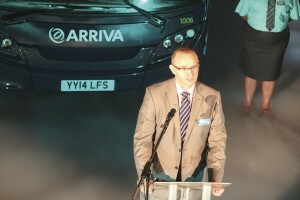 Arriva Yorkshire is a Gold Standard Investors in People company and the MD didn’t miss the opportunity to praise the team, including the ‘committed team of drivers who have all received extra training’ also pointing out that five new apprentices had been recruited over the past two years. After his speech, Nigel asked guests to count down with him to the start of the show. 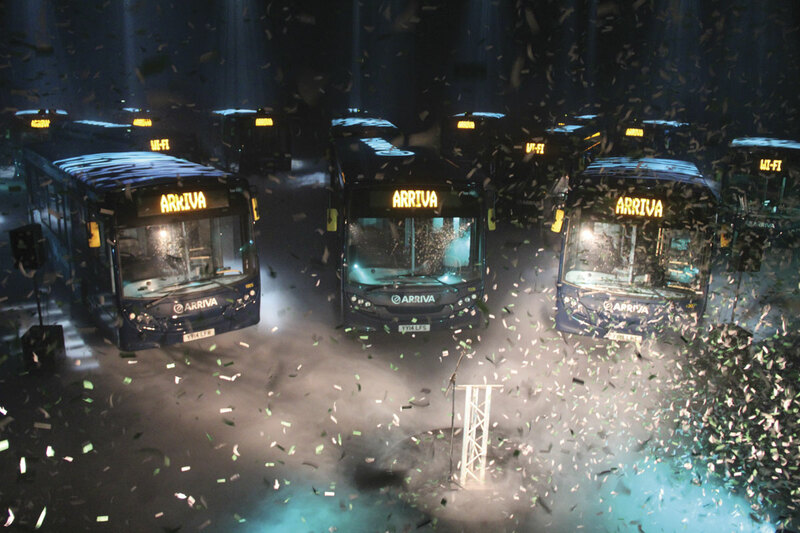 When it was over, with the ticker tape still descending, he invited them to climb the eight stories to the gantry overhead, from where they could gain a panoramic view of the buses which were laid out in the form of the wi-fi symbol, wi-fi provision being one of the key enhancements introduced on the new vehicles. The climb was worth it, not only for the view and the photo opportunity from the top, but for the chance to take in the chronological history of technological advances in the music industry graphically detailed on the staircase walls. The buses themselves are 8.9m long ADL Enviro200s. They have Cummins ISBe Euro5 140hp four-cylinder engines but qualify for low carbon certification, with the six pence a kilometre BSOG enhancement that currently brings, by virtue of the new ZF AMT six-speed fully automated manual gearbox option, recently introduced as an option on the model. ADL’s Frank Mcghee, who was present at the launch, explained that the gearbox has a straightforward drive button like other autos, though the gearbox set up does involve a clutch system. The fuel saving is derived from the fact that it changes to neutral with no load on the engine when stationary at stops. 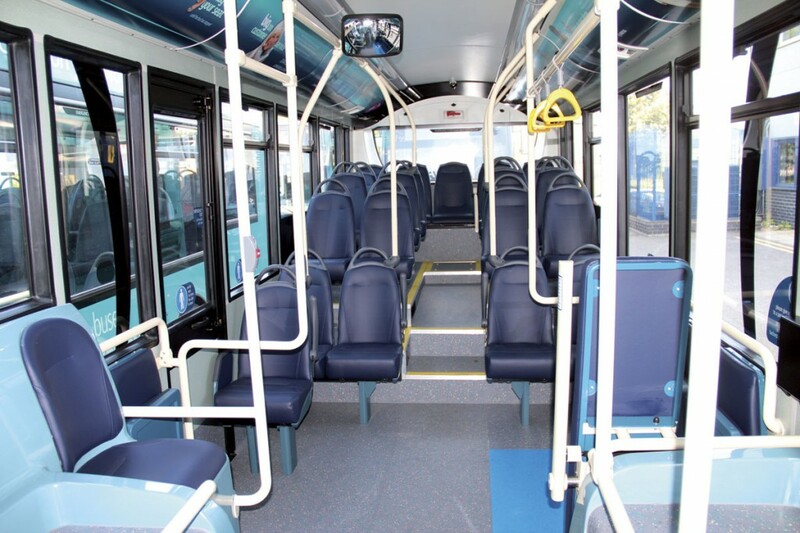 Internally, they feature 28 seats, all of which are trimmed in e-leather to create a quality environment. It would have been possible to accommodate 29 seats but Arriva has signed up to the CPT’s code of conduct regarding mobility scooters and providing the necessary space for them to manoeuvre results in the loss of a single seat. The standee capacity is 35. Engineering Director, Neil Craig, explained why the Enviro200 was so well suited to the Wakefield and Castleford operations, saying, ‘We needed the loading door in front of the wheel because of the bus stations. If the door was behind the front axle the bus station design would have prevented us getting people in wheelchairs on to the bus.’ He further explained that because of the restrictions of the routes, especially Castleford’s 188 route which has a tight bend on a bridge, other models that did offer the front entrance were too long to operate the services. Nigel Featham told me that he was pleased with the vehicle choice, saying that driver’s had been very enthusiastic about them during familiarisation training. The engineers also liked them, he said. 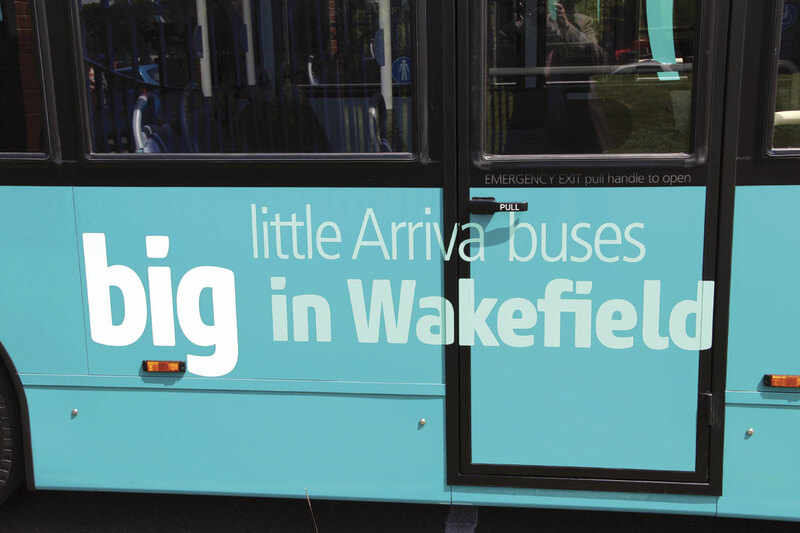 The message on the buses reads ‘little Arriva buses, big in Wakefield’ with the big much bolder than the rest of the lettering. 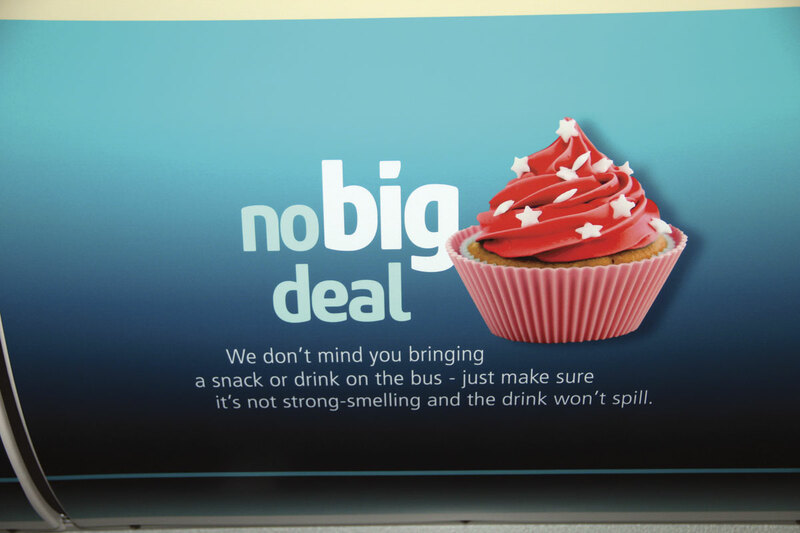 This message is carried on a new livery style using colours derived from the Arriva palette. This was devised by Ray Stenning of Best Impressions who also produced the interior look. 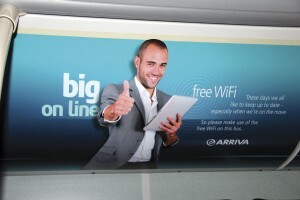 I understand that the same colour scheme is likely to be used in other areas of the Arriva empire. This has friendly but informative cove messages promoting the vehicles and pointing out their advantages. Messages about wi-fi connectivity inside are echoed externally where the cantrail panels either carry ‘stay connected on the move’ or ‘get connected on your way into the city,’ depending on which depot they are allocated to. They are designed to be welcoming and not to talk down to customers. He said the whole idea behind the branding had been to create something that said something to local people. Previously the buses had been anonymous with no local feeling about them, so the idea had been to bring in a feeling of place. He believed part of a place’s local zeitgeist was having its own buses. ‘The bus is effectively having a conversation with its market,’ he said. The Enviros are straight replacements for Plaxton MPDs (Mini Pointer Darts), some approaching 15 years old, which will be withdrawn. 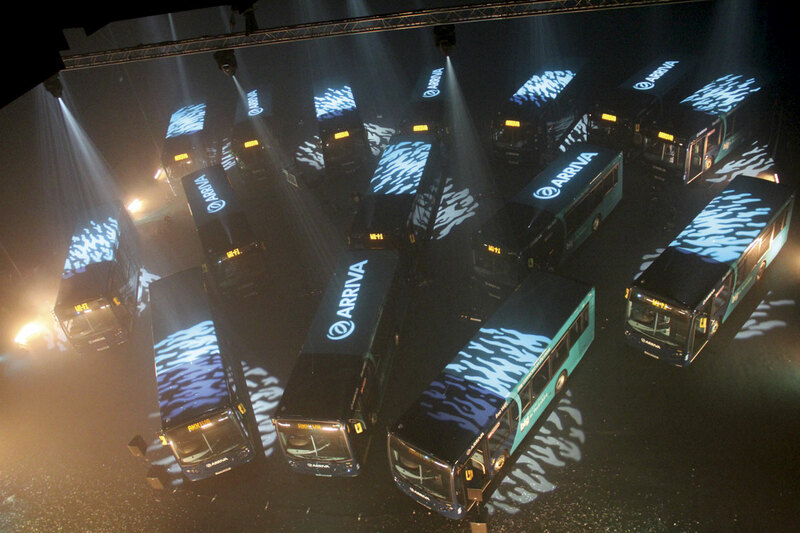 After the launch, the 31 buses headed straight into Wakefield and Castleford to enter service. 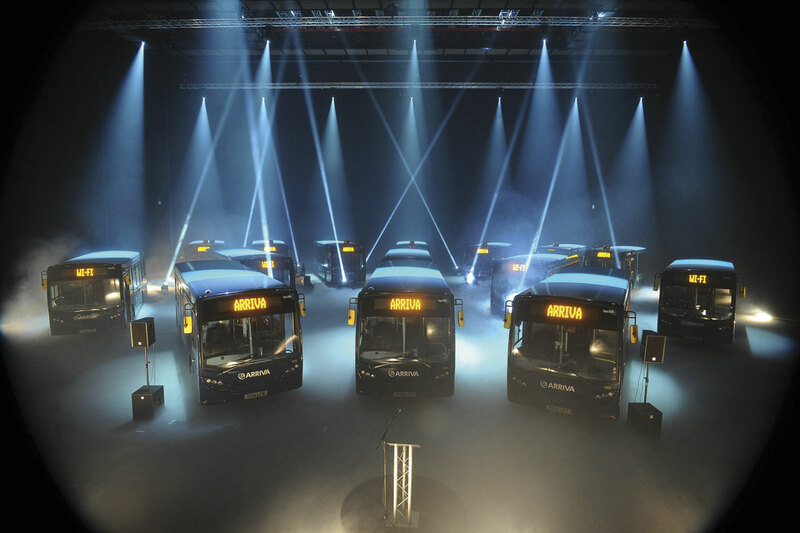 Nigel Featham explained that the idea was for people who had gone to work on an old bus in the morning to experience the bright new product on their way home. Arriva Yorkshire’s fleet was already a relatively modern one and this maintains the standards that have been set under Nigel Featham. The current average fleet age is only 5.6 years and taking advantage of the sun after the event to update my photographic collection it was noticeable that the standard of presentation was high. Of the 31 buses, 23 are for Wakefield and eight are for Castleford. With allocations of 111 and 57 respectively, well over a fifth of the fleet is being replaced at a stroke. 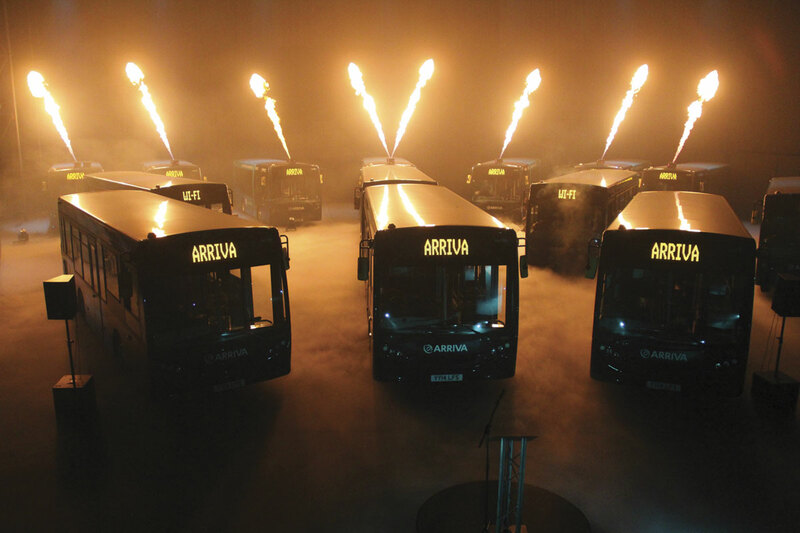 With such a major new vehicle influx the buses cannot fail to make an impact and the high profile launch sought to maximise this. There has been other significant investment at both depots in recent years. At Castleford, 2013 saw the introduction of 12 Volvo B5LH Wrightbus hybrids on the 163/166 services between Castleford and Leeds. These have been extensively marketed under the ‘It’s live, it’s electric’ slogan. At Wakefield, March 2012 saw 41 new Wright Gemini bodied VDL DB300 Euro5 double deckers introduced on the 110, 126 and 127 routes and, from Heckmondwike, the 229 route. 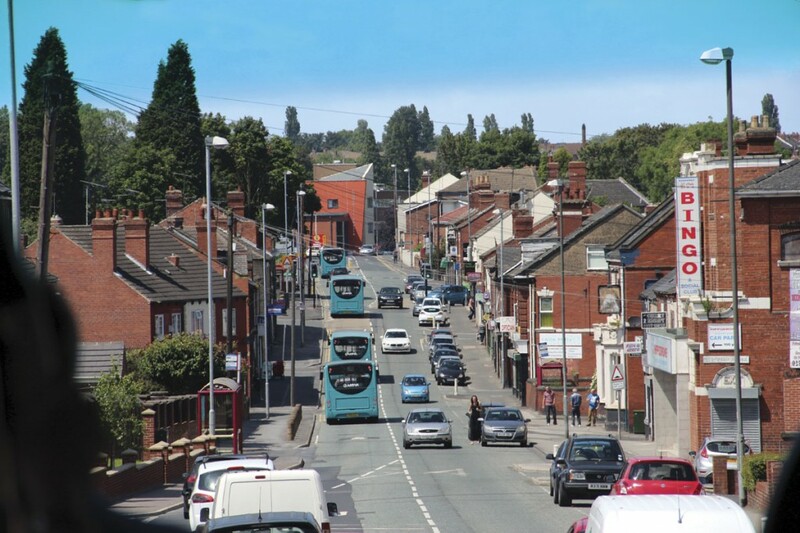 On 27 May, Castleford began trialling the GreenRoad telematics system and the first week’s results showed a 40% reduction in ‘events’ demonstrating the improvement made on driving standards. It is envisaged that the scheme will be extended to other depots in time. 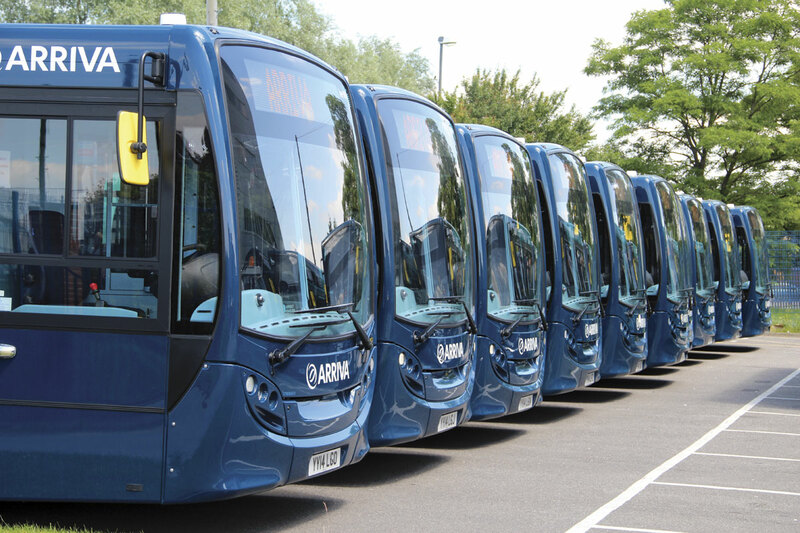 Arriva also has the EcoStars vehicle recognition scheme locally and is one of only two companies in the country (the other is Stagecoach in Durham) to have a five star emissions rating.